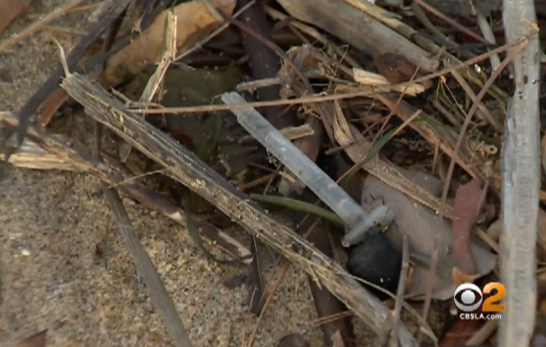 NEWPORT BEACH, Calif. -- Robin Dial can’t believe the countless hypodermic needles that are still littering her favorite dog beach in Newport after recent rains, CBS Los Angeles reports. “It’s amazing how many of these I found,” Dial said, as she picked up a needle. Everyday, Dial says she picks up as many as she can find and throws them away to protect her dog, Maddy. “If they don’t have the tops on them, there’s a good chance you’re gonna step on a needle,” Dial said. “I worry about my dog being out here, but it’s the only dog beach that’s around here,” she said. With Monday being a holiday, the city was unable to respond. Police got so many complaints that an officer was sent out and 75 needles were found on the unofficial dog beach in a short time. Bruce Patterson brought his dog Tess to the stretch of sand where the Santa Ana River feeds into the ocean at Newport Beach. On social media, the needles are drawing sharp criticism. “Dogs and humans should stay away,” one woman who posted pictures of the needles warned on Facebook. Kelly and Wayne Brown are surprised that their nightly walk with their dog, Yager, is now littered with needles that they say surfers and beach visitors have been removing, not the city. “I think it’s horrible. I don’t know where all this trash is coming from either,” Kelly Brown said.